You may have never thought of a drug store as a great avenue to save money on groceries and household items, but the savings can be staggering! Weekly ads for stores like, Rite Aid and Walgreens are teeming with rock bottom pricing on more than just prescriptions and personal hygiene items. If you underutilize these savings venues, it would be fiscally wise to look again! So how do you maximize your savings and still stay in budget? Learning the savings basics is simple. While it’s true that many national drug store chains pricing is higher than local grocers, most also offer loyalty/rewards programs with huge savings incentives! As an example, Rite Aid offers a Single Check Rebate program which reimburses consumers for product purchases. These online rebates are one of the simplest forms of rebate programs as they do not require cutting and mailing UCPs. You simply buy the advertised product, and even use a coupon when possible to lower your initial purchase price, visit www.RiteAid.com to enter basic receipt information all month long and request your refund at the end of each month. You’ll get up to the full sale price, regardless of coupon savings, refunded at the end of the month in the form of a rewards check. I call this a Money Maker! In addition, Rite Aid offers seasonal Gift Of Savings rewards programs, which give consumers gift card cash for everyday purchases on top of all other promotional offers! Did I say Money Maker yet? Plus, Rite Aid now offers Up Rewards coupons, good for cash off your next Rite Aid buys, with select product purchases, as well as printable Video Value Coupons which can be stacked with manufacturer coupons for double the savings!. #1. You can only get one Register Reward per promotion in a single purchase. You can get multiple Register Rewards in one purchase when you buy products from different promotions. #2. You cannot use the exact Register Reward to pay for a product participating in the same promotion in a following transaction. Ie... If you buy Olay and get a Register Reward you cannot use that Reward to buy another Olay product. #3. You can’t use more coupons than products purchased and a Register Reward is considered a coupon. It might sound difficult, but once you get your feet wet and try it you’ll find out how easy it is to save with this rewards program. Beyond rewards programs there are also a plethora of grocery and household products competitively sale priced each week. Coupons are a must and can even be combined with in-ad store coupons. If a store offers a non-manufacture coupon in their weekly ad or coupon booklet, most drug stores will allow you to stack a Sunday newspaper issued manufacture coupon on top of the store coupon and you’ll see double the savings! Stacking coupons this way definitely helps stretch your budget! My suggestion for implementing your drug store savings is to start with the basics - one store at a time. Master the savings for each drug store before adding another store to your shopping list! Make sure you pick up an in-store Rite Aid Single Check Rebate Guide or Walgreens Coupon Book each month and familiarize yourself with their contents. Then, visit www.SavvyShopperDeals.com and check out the amazing Shopping Wizard, an interactive, detailed shopping list of the best savings at these and many other retailers to maximize your bottom line! Saving at the drug store has never been easier! Happy Valentines Day! I truly love this amorous holiday; not because of expensive gifts and baubles, but for the flowers! (Now, lest you think my dear hubby only brings them on holidays or to mend fences - I must say he is as thoughtful as a woman could ask for and brings them often - and he's taken!) I love flowers, and have from my youth. I even helped support myself through college working as a florist. I have done weddings, funerals, dances and bouquets off and on for years. There is nothing like transforming what is already amazingly beautiful in nature to something even more spectacular. However, one thing's for sure - they can be expensive and you want them to last as long as possible. One way to cut costs is to buy pre-packaged "cellophane" bouquets from stores like Costco or other retailers and design your own arrangement. But whether they come already in a vase from the florist or as more of a do-it-yourself arrangement project, here are some of my favorite tips for preserving fresh flowers and even arranging them yourself! Cut Flower Stems: When cutting flower stems for arrangements make sure to cut the ends on an angle. Leaving stems with a "flat" cut can prevent full water absorption and the flowers can die prematurely from dehydration. Use the Right Tools: A sharp knife - NOT SCISSORS, is the key to a successful cut! Scissors can crush stems and cause significant damage to stem structures, again inhibiting water absorption. Remove Excess Foliage: Removing any leaves that will be below the water level is a key. If these leaves remain under water they will start the process of decomposition quickly. This promotes the growth of bacteria, which is the cause of those bad odors you may have experienced previously. But, even worse, the bacteria clogs stem ends and impedes water intake - thus leading to premature wilting. When removing excess leaves make sure to not scrape and damage the stem. Use your fingers when possible, instead of a knife. Check Water Quality: Whether from a florist or arranged at home, water quality and temperature is vital! It is best to use clean, lukewarm water in floral arrangements. Warm water contains less oxygen and thus reduces the risk of air embolisms. Never use hot water! If you notice cloudy water and wilting flowers in your arrangement after three or four days, rinse and refill your vase again and even consider re-cutting the stems. You'll notice a quick improvement in flower quality! Feed your Flowers: There are many home remedies for promoting flower life. Adding anything from mouthwash to lemon-lime soda can be used to extend the life of cut flowers. However, commercial preservative packets are readily found in almost all pre-wrapped flowers and also from florists and should be used when possible, as they are the most reliable in delivering an effective combination of ingredients. Keep Away from Fruits & Veggies: Ethylene is a gas naturally produced by ripening fruits, vegetables and even flowers! However, too much ethylene is bad for flowers. To reduce ethylene absorption, keep fruits (especially apples) and ripe vegetables away from your floral arrangement. Arrange Your Own: Arranging your own flowers isn't that hard! In fact it's as easy as making a triangle. The most basic shape of floral design is geometric and symmetrical. This will generally be a one-sided design and is the simplest to create. Just envision an imaginary triangular outline and fill in the space. First, fill your vase with any greenery you desire. Next, stage your main (and most expensive) flowers in three's when possible, one in each side of the triangle at staggered heights. It is not necessary to repeat all the remaining flowers in this "mirror" image. This would make your arrangement appear too unnatural. Last, add any "filler" flowers like Baby's Breath or Wax Flower. Try to re-create how flowers would grow in nature, grouped together with the smallest buds at the top and the fullest flowers near the base. Floral design can be very rewarding and ultimately save you money! Try these simple tips to extend floral life and create more beauty in your home! 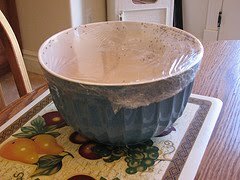 Surface Hard Water/Soap Scum Buildup: If your drains or other surfaces are blotted with water marks and soap scum, wet a paper towel or soak a sponge in white vinegar and apply to desired areas. Let sit for 30 min - 2 hours. Wipe and rinse those stains goodbye. (Do not use on marble as it is too porous). Showers/Faucet Buildup: If your shower head or faucet is clogged with minerals try this simple fix: Remove head from the fixture, add to shallow container of vinegar (enough to cover the holes) and let soak for a couple hours or overnight if needed. Wipe off any excess minerals and let the water run! Cloudy Vases: Some narrow neck vases are difficult to run through dishwashers. To remove any cloudy haze from these containers, fill with equal parts vinegar and water and let sit for a few hours. Rinse and check out the sparkle! 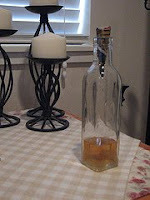 Fruit Flies: This past summer I had an "infestation" of fruit flies at my house after a day of peach jam making. I thought I would lose my mind until I made this simple trap with vinegar! Buttermilk: In a pinch, add one tablespoon of white distilled vinegar to one cup of milk to make your own buttermilk! Let the mixture rest for 5 minutes to thicken. Combine ingredients in slow cooker. Cook on high for 2 hours or to desired temperature. Serve as a side dish or with tortilla chips. Vinegar truly is a pantry staple a household should never do with out!